Did you get the letter from the Town about the Public Hearing on adopting the Flood Maps? Homeowners have been waiting for these new maps since they were first presented in 2014 because 92% of the properties on the island will have a better flood rating. Many VE properties will even change to AE, resulting in lower flood insurance premiums when your policy renews after August 28! The public hearing is required by law for the Town to adopt the maps. 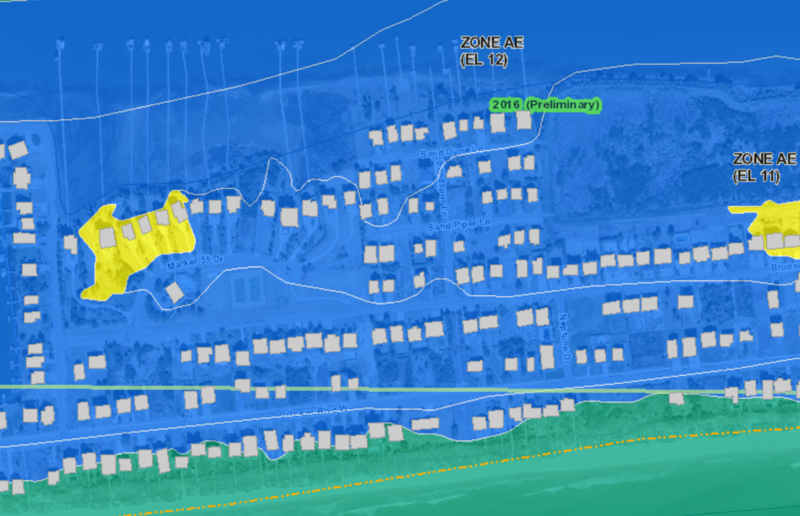 You can check to see what the new flood maps for your property will be by clicking here. Zoom in to your property and you can determine what your current designation is. Click on your home and get all the details on the right side of your screen. Use the drop-down menu in the top right corner to change from Effective to Preliminary. This is what your new flood rating will be. Again, click your home to see the changes. Many properties go from a VE designation to AE – which will significantly lower insurance premiums. Most properties also have a lower Base Flood Elevation (BFE) which will also lower premiums. Another factor for homeowners looking to do renovations is that the lower BFE will make this easier and less expensive.